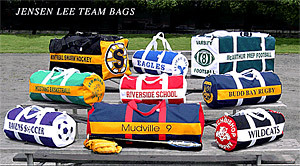 High quality team equipment bags are custom designed especially for you! Important Note: Team orders of 6 or more receive discounted pricing and free shipping along with ability to customize with team logo. The prices shown are for a quantity of 6 - 11. Please see the product details pages to view prices for larger quantities. Prices will be automatically adjusted according to the quantity ordered. Please browse the links below to view all custom team equipment bags.